The Lightning Bundle Explorer helps you to concentrate on work purely on the Lightning Applications and to manage them. 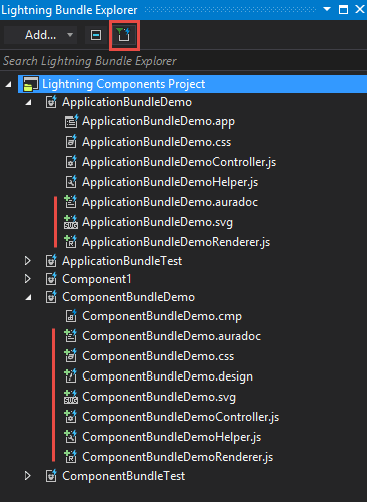 Its structure and purpose are similar to the Solution Explorer: Lightning Bundle Explorer visually represents the structure of the Lightning bundles in your project; here you are also able to filter items and add new ones. 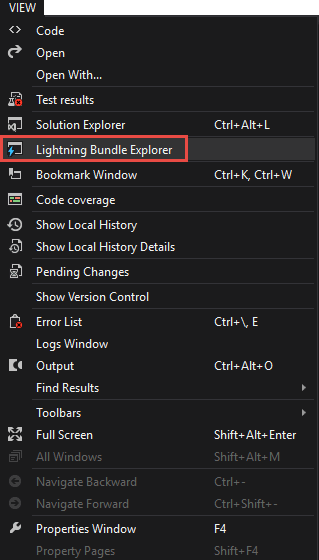 In order to get access to the Lightning Bundle Explorer, open it from the Main Menu: View ⇒ Lightning Bundle Explorer. You will get the opened panel with all your Lightning items — no matter where they are located in the project structure you always can see all of them here. All your bundles are combined under the project. 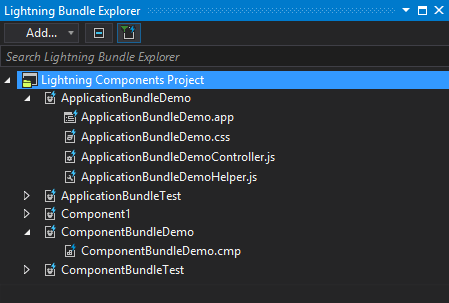 You can expand any bundle to see what components it includes. Above the structure of the Lightning bundles, you can find all the main options of the Lightning Bundle Explorer. the double-click on unexisting files (visible by untoggling the Show Only Existing Files button). See more about adding new items and including already existing items that are absent into your org in the Adding Lightning Bundle and its components section. Double-clicking on any item of a bundle will open it in the built-in Lightning editor, where you can customize your components as you want. The Lightning Bundle Explorer offers you two options of how to find necessary items in the quickest and the most suitable way. 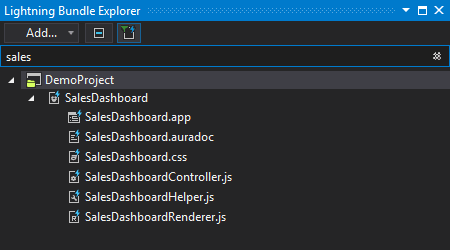 The Search Lightning Bundle Explorer input box at the top of the panel. Type here the name (or part of the name) of the item, which you are looking for. All the items will be filtering to only those containing the entered search term, preserving the structure. Clicking on the x at the end of this text box will clear the filter. The Show Only Existing Files button. Untoggle this button and you will see the whole list of members for the bundles. The files that are not yet created will have the 'plus' icon. This feature is very useful when you are creating new bundle's items. In addition, the button Collapse all at the top of the panel will help you to clear all the filters and collapse all the items to the project's level.